Back Bar design starts with a theme in mind. Keeping your project within budget will decide what materials you can afford, either real or imitation. Use cabinets or no cabinets at all. Always use tempered glass shelves to allow light from above. Mirror backs used to be popular, but today it’s flat screen TV’s (seen in the photo below). 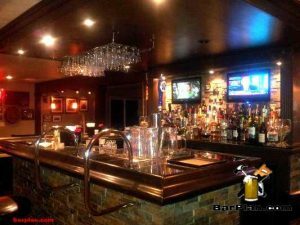 A mix of primitive stone, high-tech displays and stylish metal work creates a visually appealing and entertaining bar back. The modern bar back at left uses a minimalist approach. No wood cabinets, just an elegant stone backdrop with custom metal numbers for the aptly named “844 Bar”. The spot light accents the stonework and casts interesting shadows. Dual flat screen TV’s deliver a sports-bar-like experience. This sample project is just the starting point for many great ideas. A lighted bottle step would be an excellent functional accent addition for this pub. If you’d like to go with a traditional all wood cabinet approach, the EHBP-11 is a convertible 3 in 1 bar back project that can be built as a top, bottom or entire back cabinet. 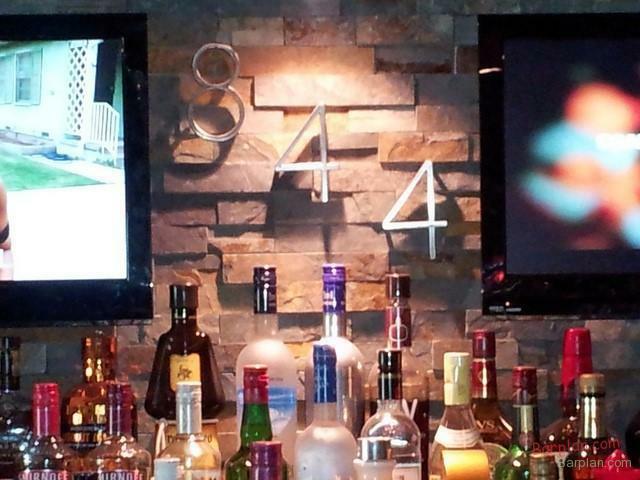 The minimalist approach sometimes works best as with the “844 Bar” shown below built by one of our more skilled website members. From the dark ceiling with recessed lights to the stone facing, HDTV’s, bottle shelves and brass service area rails, everything about this bar is right. Want to see more Bar Back details? There are more details about this topic on our EHBP-11 bar back design page. This site is also filled with photos of projects that use this design. Take a look around. Check out the Bar Photos page and the Bar Videos page for many other examples. Preview the builder’s gallery too and you’ll see just how many incredible projects there are to feed your own ideas. DIY Floating Bar Concept Where Are The Home Bars?